Having a new puppy in your home can be a great joy. Puppies are so full of life and ready to explore that many pet parents simply don't want them to grow up. However, it's important that you plan for the years ahead. Puppies grow up fast. Before you know it, they'll be adults with size-specific needs. You're going to want to plan ahead for their play space, crate, food, and so much more. But how do you know how big your puppy is going to be as an adult? Having a general idea of how big your dog will be can make a world of difference as your pup grows up. It's not uncommon for new dog owners to realize that their growing dog is too much for them to handle. Whether you're scouring adoption centers for that perfect canine companion or you already have a puppy that you love, there are a few ways you can determine their approximate adult height and weight. If you know what breed your dog is, you already have a general idea of how they will be as an adult. There's a lot of information about purebred dogs out there. You can easily find their weight range and height. With that being said, there are always outliers. The best way to see how a dog will be when their older is to take a look at their parents. Generally, dogs will look very similar to that of their parents. They'll take genetics from both sides, so you can average out their parents' size and weight to get a pretty good idea of your pup's future. If you know the exact age of a newborn puppy, you can estimate their adults weight with a few simple mathematical equations. You'll have to keep track of their age and weight from their very first day. Generally, puppies will double their weight by the time they've reached 1 week of age. So if your new puppy weighed 1 pound at birth, they should be 2 pounds by the time they're a week old. At this point, their weight will grow approximately 5 to 10 percent each day. The exact percentage increase will depend on a number of factors, including how much they're eating and genetics. To calculate this, simply add 5 to 10 percent of their cumulative weight each day. This weight gain will continue until they reach 6 weeks of age. At this point, their breed classification will determine how they will grow. Determining the adult weight of a small dog is pretty easy. They will continue to grow after 6 weeks, but the weight gain won't be as significant compared to larger breeds. To estimate their adult weight, take their weight at 6 weeks old and double it twice. Let's say that your puppy weighs 2 pounds at 6 weeks. We'd double it once to get 4 pounds, then double it again to reach 8 pounds. Their adult weight will be approximately 8 pounds. Larger dogs will continue to gain that 5 to 10 percent passed the 6 weeks mark. They tend to grow faster during this period, so you can expect a pretty significant growth spurt. When estimating their adult weight, you'd have to look at their weight at 14 weeks of age. This equation is a bit tricker. First, take their 14-week age and double it. Then, halve the original 14-week age and add that to the previous step. So, let's take a puppy that weighs 16 pounds at 14 weeks old. We'd first double that 16 to 32 pounds. Then, we'd take half of the 16, which is 8, and add it to the 32 for a total of 40. As an adult, this puppy would weigh around 40 pounds. What If I Didn't Follow Their Weight From Birth? Unless you have a pregnant dog or know someone else that does, you probably won't know your furry friend from birth. In fact, most adoption centers won't allow you to take a puppy home unless it has reached a certain age. If you have a slightly older puppy, you can still estimate their adult weight with some math.The mathematical formula is the same for all dogs regardless of their breed and size classification. However, the specific factors you'll use in the equation is different between small breeds, medium-sized breeds, and large breeds. To see how big your dog will be as an adult, take their weight in pounds at the specified age and divide it by their age in weeks. Then, you're going to multiply this figure by 52. The 52 represents the number of weeks in the year. * Let's take a look at a medium-sized dog that weighs 10 pounds at 16 weeks of age. We'd first divide 10 by 16. This gives us 0.625. We'll then multiply 0.625 by 52 to get 32.5. This dog would weigh around 32 and a half pounds as an adult. Dogs do most of their growing in the first year or two of life. However, the amount of time they will spend getting bigger depends entirely on their breed. Smaller dogs don't get much bigger after they've reached about 6 months of age. However, larger dogs can continue to grow until they reach about 2 years old. Is There Anything That Could Affect Puppy Growth? There are a number of things beyond breed that could affect how big your dog gets. Gender is one of them. Generally speaking, males tend to be bigger than females. When you're looking at a weight range for a specific breed, males are usually at the top of the scale while females are at the bottom. Of course, females can sometimes outweigh the males. It all depends on genetics and upbringing. Neutering and spaying are also big factors to consider. Dogs that were neutered or spayed early tend to weigh more as an adult. That's because the process changes chemical signals in the body. Neutering, in particular, has been known to stop the chemicals that tell the bones to stop growing. 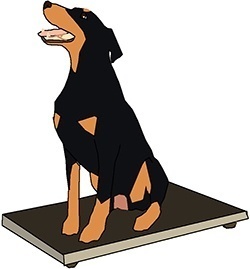 As a result, dogs that were neutered relatively early in their lives can grow to be a bit taller than average. Puppies can also experience stunted growth. When this happens, your dog may not reach a healthy weight and might suffer from a number of health issues. Worm infestations are one of the most common causes of stunted growth. The worms are essentially leaching nutrients off your dog, causing malnutrition. If this happens, it's important that you take your pup to the vet as soon as possible so that the worms can be dealt with. It's also important that you provide your pup with a high-quality dog food that's chock full of all the vitamins and nutrients they need to reach their full growth potential. As mentioned earlier, dogs grow pretty fast. It can be hard to keep track of how much they're growing because dogs often go through growth spurts. One thing that many dog owners don't realize is that the needs of a puppy change constantly. As they're going through these rapid periods of growth, their bodies will need plenty of fuel to thrive. While you may be used to providing them with a set amount of food every day, they may need more food during a certain period of time than another. The key to finding that right balance is to keep track of your dog's weight and adjust accordingly. If they seem sluggish or extra hungry, don't be afraid to give them some extra kibble. As long as you're not overfeeding them, they'll benefit from those extra calories. It is very dangerous for puppies to become underweight. A lack of essential nutrients during these developmental years can affect the entirety of their lives. You can usually tell if your dog is underweight by taking a close look at their bodies. If you can clearly see their ribs poking through their skin, they definitely need to plump up a bit. There are a number of ways to do this. You can increase their caloric intake or switch to a weight-gaining dog food formula. Many puppy-specific recipes are higher in calories, so you shouldn't have problems finding an option. If you suspect that your puppy is underweight, you should also take them to the vet. They may be suffering from worms or a host of other health concerns. A vet will be able to address the issue and help you get your puppy to a healthy weight again. Estimating your dog's adult weight is very beneficial as they grow. It gives you the knowledge you need to make important health and lifestyle decisions that will affect them their entire lives. Also Read: How to Fatten Up a Dog?